READ TIME: 2 min. 57 sec. 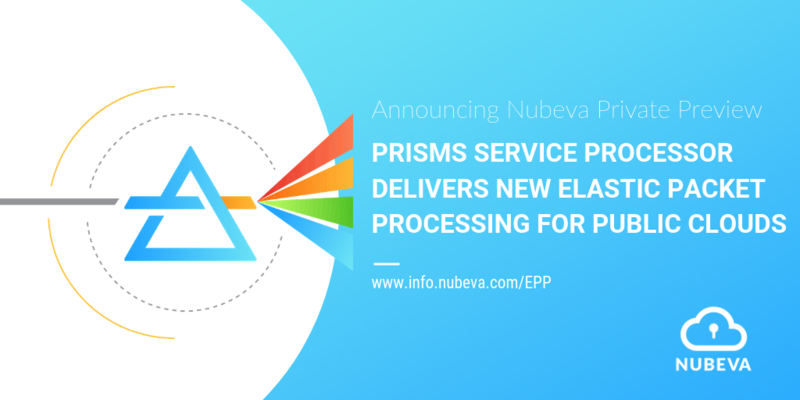 TL;DR: On April 17, 2019, Nubeva launched its new Prisms Service Processor with Elastic Packet Processing to enterprises that seek to maximize visibility in the public cloud. The new container-based solution delivers high-performance, autoscales, filters, slices and multiplexes traffic between any source and any destination. In addition, the PSP engine will be home to future, modular packet processing services. Business moves faster in the cloud. It’s as true for us as it is for our customers. At Nubeva, we strive to stay ahead of the cloud-curve and far in front of the increase in demand to use cloud packets efficiently and effectively. With this in mind, our developers enhanced and expanded our disruptive Nubeva Prisms technology, creating the new Prisms Service Processor (PSP) architecture with Elastic Packet Processing (EPP). With the new Nubeva Prisms Service Processor engine, companies can run their security, monitoring and storage solutions in the cloud while optimizing application performance and cloud network usage at the same time. The PSP engine is a container-based, high-performance, autoscaling packet processor that filters, slices and multiplexes traffic between sources and destinations. This cloud-native architecture is container based and will be home to our future, modular packet processing services. Nubeva’s Prisms Service Processor is the only packet stream processing and replication service engineered for high performance and scaling in cloud-first environments. Launching and configuring either lab systems or high-availability, autoscaling production systems is done in seconds using the fully automated mode that makes use of Cloud Formation Templates (CFTs). Packet stream replication. Source workload-based replication and multiplexing taxes the source workload NIC and drives up cost. It can also take away compute resources from primary functions and recuing overall performance. Our new engine with elastic packet processing capability offloads the replication burden from source workloads allowing them to experience boosted performance from the reduction in non-workload tasks like packet stream replication. Advanced packet filtering. Azure VTAPs, for example don’t handle packet filtering. Instead they can send full, unfiltered streams to tool and storage destinations, which taxes cloud networks and consumes storage and tool capacity with unwanted and unoptimized packet data. We solve this with advanced packet filtering and packet processing. Orchestration & Automation. Infrastructure utilities are a great first step for use in cloud platforms. But, at least right now, they are still complicated CLI utilities that lack an easy user interface and don’t provide any automation and orchestration. We solves this even in environments using only infrastructure mirroring and tapping. Complete Availability. Cloud platform providers are rolling out infrastructure TAPs and mirrors but these are not available in all regions just yet. Our Prisms Service Processor is available in all regions and on AWS, Azure and GCP public clouds. IT teams need to keep applications and resources secure and optimized. The undisputed best way to enable security and network performance is through cloud packet monitoring. As public cloud market growth tops $214 billion in 2019, enterprise IT organizations must find the best avenue to quickly and easily manage packet acquisition at production scale. The new PSP engine with elastic packet processing serves up the performance that enterprise IT groups demand by automating, orchestrating and managing the agentless cloud tap infrastructure, while optimizing application workloads and cloud networks. Now you can run your security and monitoring tools in the cloud, at scale. Our Prisms Service Processor is available now. To request access to the PSP private preview, visit https://info.nubeva.com/epp.